And if you’ve been following us, you know that we here at Football Garbage Time have gone head to head against Wally, Will and Ray at Urban Sports Scene on our NFL Picks for the last 3 seasons. Why? Because they’re awesome competitors, they KNOW their sports, and, heck, they’re just good guys! But this year, we’ll have their picks up right HERE each and every week, so keep it tuned in, to both us and them, because we’ll be picking all season all long. Last year I ended up with a 62% record for the season, so that’s three years in a row with over a 60% pick rate. I made even more ground in Week 4 pushing me up to 39-22 (63.9%). Boom. Told you I’d get you up there to 62%+. And I intend to keep you there. The Patriots started to look like the Patriots in Week 4 against the then undefeated Dolphins, and although they may have a gimpy Gronk on a short week, Sony Michel broke out big and Julian Edelman returns from his 4 game suspension. Plus, the Colts have zero secondary, being ranked 26th and 28th in the league defended WR1 & WR2 respectively per DVOA. Maybe even Chris Hogan gets going this week with that type of defense. Andrew Luck looked better in Week 4, but there’s zero run game there and an ill-fated 4th down attempt in OT lead to another loss. Luck is likely to get better over the season, but not in time to beat Brady and company. I know, I know, Patrick Mahomes is awesome. And the Chiefs offense is unstoppable. But they haven’t faced the Jaguars yet, who have the second best defense in the league per DVOA. More importantly, the Chiefs defense is horrific, ranked second to last in the league per DVOA. They just got destroyed on the ground by the Denver Broncos on Monday Night, which is saying something seeing how ineffective Denver has been on offense this year. If not for late game heroics by Mahomes, the Chiefs would have lost to a far inferior offense in Denver. This game will certainly be close, but Blake Bortles does just enough with TJ Yeldon to take advantage of the Chiefs terrible defense and the Jags do just enough to bring Mahomes down to earth. Entering week 5, there are only two undefeated teams remaining in the NFL, and if you haven’t been keeping up, one of them isn’t the New England Patriots. The Kansas City Chiefs (AFC South) and the Los Angeles Rams (NFC West) are the two 4-0 teams. Could these two teams face off in the Speer Bowl? The Kansas City Chiefs will be hosting division rival Jacksonville Jaguars (3-1) on Sunday, and the Jaguars aren’t a team to be taken lightly. In the first four weeks, the Jaguars have allowed the second least offensive yards in the league (1,037). Only the Washington Redskins, who are coming off a bye-week in week 4, have allowed less with 837 yards. The Jaguars defense has allowed the least points to opposing teams, averaging 14-points per game. The defense hasn’t allowed more than three passing touchdowns in any one game this season, with their only loss to the division rival Tennessee Titans (9-6). The key to the Jaguars winning against the Chiefs will be two factors. Quarterback rating week-to-week this season: 67.2 (week 1 against the NY Giants); 111.0 (week 2 against the New England Patriots); 72.5 (week 3 against the Tennessee Titans); 114.8 (week 4 against the New York Jets). Luckily, the Kansas City Chiefs have allowed the most yards this season with 1,807 yards. There’s no room for errors when going up against the 4-0 Chiefs lead by Patrick Mahomes. The Jaguars have the second most penalties this season (tied with the Philadelphia Eagles) with 35 penalties, and have been penalized 354 total yards. The Kansas City Chiefs look to good to stop, but the Jaguars should give them a good old fashion fight. This game will be a coin flip, but I’m picking the Jaguars to win. I know…and, I’m not crazy. As we head into week five, I find myself in an unfamiliar place. I’m trailing HaKung by two picks for first place. So, gloves are off, and I’ll just go perfect this week. Thursday Night Football can be a bit unpredictable. But, Andrew Luck has never beaten the Patriots, he’ll be without T.Y. Hilton, and the Patriots will now be rolling out Edelman, Gronkowski, and Gordon. The Patriots win going away. The rest of the slam dunk picks- Cincinnati, Kansas City, Carolina, and the Chargers should all hold serve at home. Save for the Minnesota debacle, it’s pretty safe to just bet against Buffalo at this point, so give me Tennessee getting to 4-1 with a road win in upstate NY. You could make a case for Cleveland being 3-1 or even 4-0 at this point in the season. 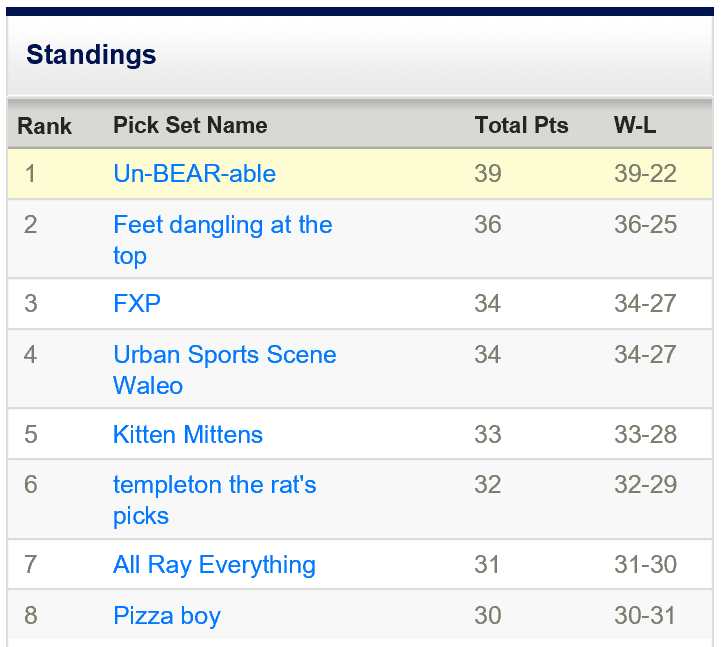 They were perfect against the spread through three weeks, and let’s be real, got hosed last week. I like the Browns at home against Baltimore. I like the Rams in Seattle to get to join the Chiefs at 5-0. Houston will put together there second straight win, and seeing’s how it’s against Dallas, it may be there second straight gift wrapped win. We’ll round out the week with New Orleans climbing to 4-1 outlasting Washington in a shootout. I finally rebounded with a 10-5 week, not too bad. I had the Broncos over the chiefs as my upset, which looked pretty good for most of the night. Nothing major this week, still grinding. Finally got 10 wins in a week, so feel like I am starting to hit my stride. If you are still alive in a suicide/eliminator pool take the Patriots on Thursday night. For Sunday my first upset pick is Cleveland. Best time to catch the Ravens is the week after playing Pittsburgh. Yes the Browns lost a heartbreaker last week but I think there defense will bounce back and Baker Mayfield will take care of the football. And that will be enough against a Ravens team that can be had (see the Bengals earlier in the season). The game I am looking forward to the most is Atlanta at Pittsburgh. Someone’s season is going down the drain. And for me it will be Atlanta because it’s hard to win on the road with that terrible defense. Green Bay-Detroit is a coin flip game too. I’ve leaned towards Detroit because Aaron Rodgers record at Ford Field isn’t great and the Packers offense was substandard vs. Buffalo (Rodgers said so himself). Other road upsets I like are Arizona (the bloom will come off the C.J. Beathard rose), Jacksonville (there great defense travels and will find a way to frustrate the wizardry of Pat Mahomes) and Oakland winning at the Chargers (which will be like a home game for the Raiders anyway). I have picked the Redskins wrong every game this year so hopefully that trend continues and I am taking the Saints. 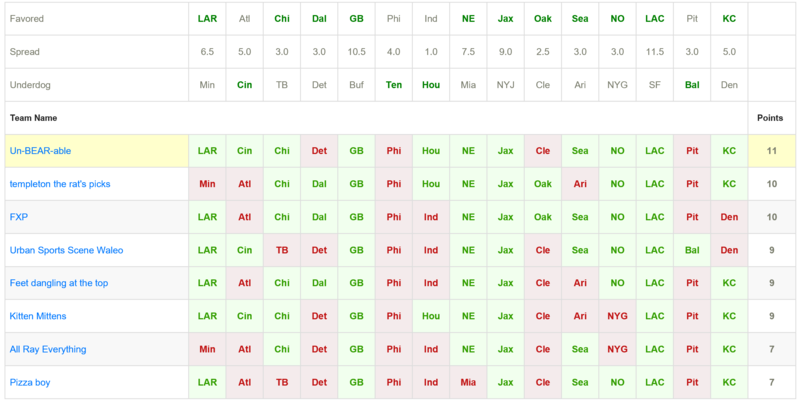 Check back next week for our Week 5 results and Week 6 picks!